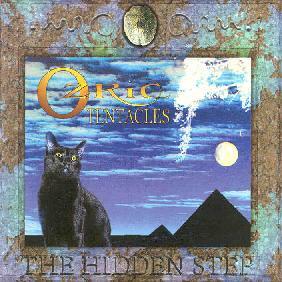 Ozric Tentacles- "The Hidden Step"
What can I say, another year, another Ozrics CD. These guys continue to move on. This is actually the band's second studio release this year, but due to conflicts with the old record label the band would not like to recognize this, so I will not speak of it any further. So the questions a lot of people have with a new Ozrics CD is does it sound the same as all their CDs, which you can only say if you never REALLY listen to them. The first thing that struck me is that Ed and the guys are truly mastering their studio environment as this is perhaps the most sonically "in your face" psychedelic CD the band has ever made. This is also the most Middle Eastern influenced Ozrics CD ever as well and Jon plays more flute and different horns, then he ever has. The first track "Holodendron" has all the classic Ozrics trademarks of soaring killer guitar solos, sweeping synths and a pounding rhythm from Zia and Rad, who I think have become tighter and tighter. Again, as on Waterfall Cities, there is a blurring between what is real drums and bass and synthetic, but this is also part of the energy the Ozrics create with this new music as it challenges you in some ways because it can't be played by humans (some of it) and therefore the band will never play it live, but it makes it sound like a real band can't sound. The title track, "The Hidden Step", starts with a nice ambient spacey intro and then the band works up a nice groove and then here comes ED. Sounds like Ed is running his guitar through some kind of processor on some of the soloing and he and Seaweed really intertwine to make a very psychedelic mix. "Ashlandi Bol" is very Middle Eastern with excellent synths and flute. Near the end when you hear the samples come in the band picks it up and Zia comes in with a thumping bass line and classic Ed guitar follows. "Ararmanu" takes you back to the Great Pyramid. "Pixel Dream" is what people would describe as a classic Ozric Tentacles sound. This reminds me of Erpland very much until the middle section when Zia kicks in with a very funky bass line and the band get into their first space funk. "Tight Spin" starts off as the Ozrics and ends as Eat Static. This is perhaps my favorite song on the CD although it is almost completely electronic. "Ta Khut" ends the CD and has a very long spacey Middle Eastern beginning with John playing a cool horn, reminding me a bit of Ole Lukkøye. Excellent CD, buy it now! !